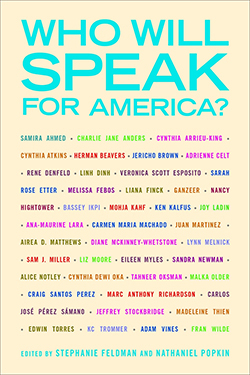 Reviewer Rebecca Hussey Speaks with Stephanie Feldman and Nathaniel Popkin, Editors of Who Will Speak for America? In these times of Republican-Democrat hostility, the mother-of-all frustrations is the unwillingness of political partisans to listen to opposing arguments. Each side is barricaded behind a truth of their own making. Facts don’t matter anymore, if they don’t support preexisting beliefs. And yet, since President Trump was elected, there is one thing the two sides agree on: The issues separating the two political parties are so important, civilization is at stake. But let’s be real: If you happen to be one of the three million or so undocumented immigrants who were brought to this country as a child, the civilization you know here in America is certainly at stake if President Trump enacts his anti-immigration policies. Every night you fear a knock on the door from the authorities. Your fear is real. You deserve to be heard. 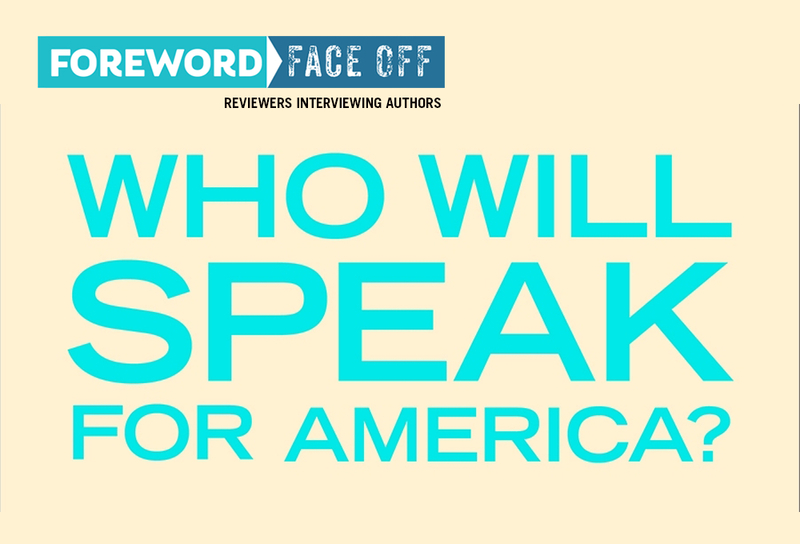 This week’s Foreword Face Off takes us back to tumultuous months following the 2016 presidential election, when Trump’s rhetoric about immigration, climate change, abortion, and other wildly contentious issues was causing sleepless nights across the country. Our interview is with Stephanie Feldman and Nathaniel Popkin, editors of Who Will Speak for America?, “an anthology of personal essays on the election’s emotional impact, fictional explorations of possible futures in an increasingly fascistic society, poetry about personal and national identity, and much more,” as described by Rebecca Hussey in her review in the July/August issue of Foreword Reviews. Rebecca recently pitched a handful of interview questions at Stephanie and Nathaniel and the resulting conversation is rich with insight about the importance of staying informed and involved. Lastly, muchos kudos to Temple University Press for bringing this project to light. As you write in your introduction, your anthology was inspired by Writers Resist events that took place around the US on January 15, 2017, the weekend before Trump’s inauguration, including the one you organized in Philadelphia. I was a co-organizer of a Writers Resist event at my community college later that spring, and I was awestruck by the energy that filled the room as reader after reader educated, inspired, and motivated the audience. Can you talk in more detail about the relationship of the Writers Resist events and the book? How did you work to bring the energy of an in-person event into print? Nathaniel Popkin: You’re exactly right. We found the energy and the feeling in the room to be both humbling and exhilarating. And it made everyone ask for more. For a while, Stephanie and I and our co-organizer, poet Alicia Askenase, attempted to keep it going with follow-up planning sessions and organizing meetings, but eventually we realized that everyone just needed to be inspired—writers were already heavily engaged in resistance work. Meanwhile, an editor I’d been working with at Temple University Press, Sara Cohen, who had attended Writers Resist on January 15, asked me if I wanted to do a book based on the event. And, immediately, when Stephanie and I started talking about how to shape it, we realized we wanted to instill in the book the same energy, rhythm, and range of voices—and, like our Philly Writers Resist event, which gestured so strongly to resistance texts from the past, we wanted to frame it as part of history. Stephanie Feldman: That range of voices was essential to the event’s success, and we knew it would be to the book’s, as well. The writers in this volume don’t just come from diverse backgrounds, but have diverse perspectives and interests. Some of the pieces are personal meditations, and some of them are radical rallying cries. Some examine American society and history, and some imagine alternative worlds and futures. They are angry and sad and occasionally joyful. Together, they’re as dynamic as America itself. Your organizational structure has two main parts: “Speaking to America” and “Speaking for America,” with each part further divided into sections such as “To Our Families” and “To Ourselves.” How did you conceive of this organizational structure? Did it come up organically as you worked with writers, or did you plan for it ahead of time? More broadly, what was it like to wrangle forty different writers and multiple genres? NP: This book was conceived in an instant: in a little more than two months, we invited authors, solicited and reviewed their work (the most pleasurable kind of wrangling), and began to see how it would cohere as a whole. A little while later, once we had chosen exactly what we thought would speak most powerfully to the title and the theme, we attempted to organize it into a narrative, so that, as a whole, the works might say something. The essays, poems, pieces of fiction, and comics organized themselves in a sense, generally speaking, as a reaction to the 2016 election and also the state of the nation before it and then as a recovery of voice. SF: It was amazing, really, how all of these writers working separately contributed to a single, if expansive, story. Together, they examine the election itself, but also look inward, outward, and into the future. How do you conceive of the role of art in a culture going through tumult? What do you think art can do? NP: We’ve seen artists and writers leading the resistance in real time and in history, and we knew implicitly that artists are the ones who give shape to disgust, fear, struggle, and hope. Unlike, I suppose, a collection of essays, which might appeal to the intellect above all, we wanted to approach the reader from the heart and the gut as well as the head. Art has always had an important role in political change—and mediocre art in maintaining the status quo. SF: We also recognize that in order to fight for your values you must first be able to articulate them. My favorite response to the Writers Resist event came from an attendee who walked in with skepticism. He thought there was little use in preaching to the choir. In the end, he found a lot of value in publicly and collectively affirming our beliefs and our commitment to fighting for them. Who do you envision as your audience? What effect do you want to have on those readers? NP: It’s hard to say. I suspect that it will appeal first to fans of the various writers and second to those who are caught up in the political crisis. We hope that an idea, an image, a concept, a reference will spark something in someone. This isn’t a book of solutions, per se, but rather a cri du coeur and a manifestation of reality. It’s also, of course, an attempt to claim some political ground. SF: I want readers to find the familiar and the unexpected in this book. It’s important to see our own experiences reflected, just as it’s important to be challenged to think in new ways. I hope readers will be reminded of the value of a diverse American community. We have different perspectives, yet we are committed to defending each other’s right to expression and happiness. The Trump administration’s daily assault can be so crushing. It’s important to remember we’re not alone. What writers from outside your anthology have inspired you recently? Do you have more suggestions to add to our reading lists? NP: I am always inspired by the work of Masha Gessen because she boils down truth so powerfully. She sees where this is all headed, too, and that’s useful to have a studied guide. Porochista Khakpour is also a truthteller who has the capacity to connect with readers and move them. The fact is that this is an immeasurably powerful moment for literature radically expanding voices. It’s hard to know that because literature’s place in American society, though perhaps never as central as elsewhere around the world, is increasingly peripheral. Perhaps it’s unfair to ask you this, but I will anyway because I look for hope everywhere I can: What will get us out of our current political mess? You must have hope for the US or there would be no point to publishing this book, but how hopeful are you? NP: Despite what I just said, I am always optimistic, by nature. But I don’t see a clear path out of this without an electoral mandate. The trouble is the drip drip drip nature of the lies, the ICE deportations, the regulatory cuts, the denigrating of the rule of law and human dignity—we’re becoming inured. We can’t grasp everything and so do we end up with nothing? Also, I go by my father, who said though he lived through Nixon (and much more) he’s never seen anything like this. Trump is a dangerous grifter. Many are complicit. Then again, at many points in American history we’ve seen very similar patterns—my greatest hope is that the Trump-inspired resistance comes to define a new era in American life. The young people are extraordinary. SF: This election made me realize how optimistic I used to be. I always believed Martin Luther King, Jr.‘s assertion: “The arc of the moral universe is long, but it bends toward justice.” Current events have challenged that conviction. Now I’ve gone from pessimism to realizing optimism or pessimism don’t really matter. We have no choice but to move forward and speak our minds and help our neighbors, no matter our hopes or fears for the future. I agree an electoral mandate in the midterms and the next presidential election are essential. We will also have to demand, through protest and lobbying, quite a bit from our new elected officials. It will be up to them to re-establish the norms of civil society and government. The Parkland student activists have given me a great amount of hope, too, and I think they’ve given us all a new burst of energy.